Sainsbury’s has started trials on using electric vans for home deliveries in London ahead of plans to roll the technology out further. The supermarket giant has deployed an LDV EV80 electric van for deliveries to customers across central and east London, making up to 30 deliveries a day. Dubbed ‘Evie’, the EV80 has an expected range of around 80 miles on a single charge and will carry out deliveries from Sainsbury’s Online Fulfilment Centre in Bromley-by-Bow where it will be recharged overnight using charging points provided by EO Charging. And from May, Sainsbury’s will start running a BD Auto e-Ducato to take on delivery duties in the same area. As with Evie, ‘Stevie’ will also feature a Carrier Neos refrigeration unit, with the box conversion carried out by Lawrence David. 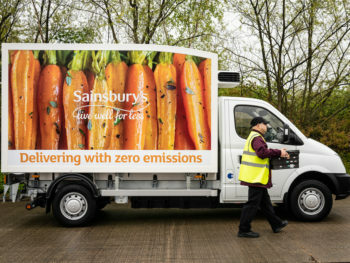 The vans could joined by additional electric vans in other areas served by Sainsbury’s Online and form part of the supermarket’s work to cut emissions from grocery deliveries. This is in line with its plans reduce absolute carbon emissions by 30% and relative emissions by 65% between 2005 and 2020. In April 2018, Sainsbury’s trialled a fleet of five electric cargo bikes, delivering up to 100 online orders a day to customers across south London from the Streatham Common store.